This bronze sculpture by artist Chester Comstock is the perfect gift for a friend or relative. 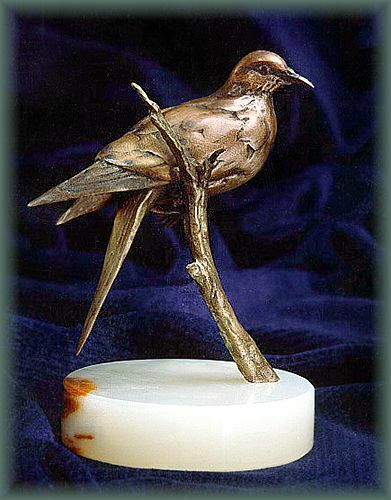 Mr. Comstock, known as the Audubon of Bronze, has specialized in depicting birds for nearly 30 years of his career. Touching and sensitive, this piece will always be a joy for its owner. Mounted on your choice of stone base: designate Green Marble, White Onyx or Jet Black Granite when ordering.